In Ep. 022, Tim talks with Robert Scott III. 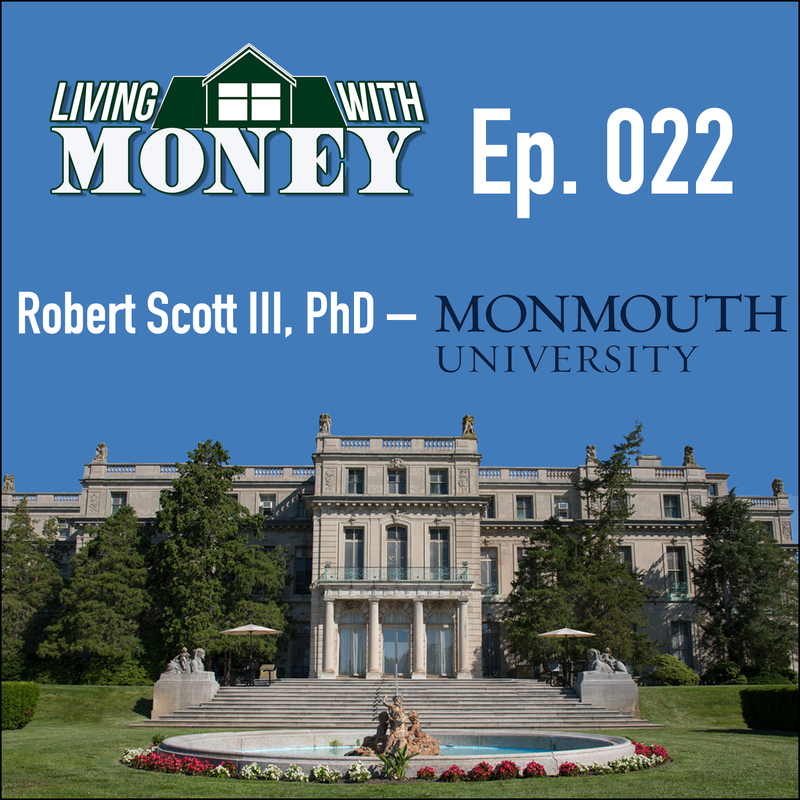 Robert has his PhD in economics, and is a professor of economics and finance at Monmouth University here in New Jersey. They talk about his firsthand experience with college students, what financial decision-making skills they need to thrive in college, what value they should look to get out of school, and how to properly utilize credit cards and get rid of debt. Tim Mullooly: Welcome back to Living with Money. This is Tim Mullooly. On today’s episode, I’m joined by Robert Scott. Robert is a PhD professor of economics and finance at Monmouth University. Robert, thanks for coming on the podcast. Robert Scott: You’re welcome, I’m happy to be here. Tim Mullooly: For our listeners out there, before becoming a professor at Monmouth, do you want to kind of give a brief background on what you were up to in life before becoming a professor? Robert Scott: Sure, of course. Well, I was born in Cincinnati, Ohio. My family moved to southwest Missouri, a small town called Joplin, it was hit by the tornado several years ago. It was really pretty dramatic. And then I went to college at a small school in Colorado which is always listed as ,the reason I picked it, the number one ski school in the country. And so that was a lot of fun. They had a trimester program where in the middle semester, you could just ski pretty much, you took one class and so you took one or two classes so you could ski five days out of the week. Tim Mullooly: That is amazing, very cool. Robert Scott: It was pretty great. So it was a very idyllic sort of place. So anyways, I initially went and I thought, “Maybe I study geology, maybe I’ll study some other things.” I kind of got into it, and I took an economics class in the middle trimester with a guy who ended up being my advisor, and it was a really great experience and I really liked it and I really thought it was interesting. And so then I just continued on. And then after that, I went and got a masters, went back to Missouri, went to the University of Missouri, Kansas City, with the intention of just getting the masters in economics. I did that. I had a couple small jobs. I worked for a commodities exchange there and then I worked for the Bureau of Labor Statistics for a little bit, and just sort of got a feel for it. But it sort of encouraged me to get a PhD, and I saw that if I really wanted to do interesting research in the government or anywhere else, you really had to have a PhD to do it. And so I did that. Pretty soon after, I never had the intention to teach, I always planned to go back and do research either or work for a private firm or something, I never wanted to teach. In fact, every time they asked me to teach a class, I said no. I said, “No. I don’t want to teach. I don’t want to have to explain supply and demand to a bunch of 18 year olds over and over and over again.” And so I said no thanks. Tim Mullooly: Time to get creative. Tim Mullooly: All the way from Missouri. Robert Scott: Yeah, I’m like, “No, we really like it in Kansas City. That’s fine.” He said, “No, no, come visit. It’s really nice.” And so I did. And so that was 14 years ago. So I’m still here. So it worked out really well. Tim Mullooly: Coming from not wanting to teach to becoming a professor, a lot of people say that teaching is the best way to kind of reinforce what you have already learned. Did you find that that kind of, because you know, you did all this studying to get your PhD, but did you really feel that it kind of cemented itself when you had to explain it to other people? Robert Scott: Yeah. One of my graduate advisors said it best, “You really want to learn something? Teach it.” And it’s absolutely true. I don’t know if I understood it better as much as I understood it in a different way. Having to explain things, sometimes two, three, four times in a different way to students just makes you realize there are lots of different ways, it’s not just so cut and dry. It’s not just this one way to look at it. There are lots of different perspectives and lots of different ways to analyze a problem and look at it from all sorts of different angles. Tim Mullooly: Yeah, more well-rounded concept of what you’re explaining. Tim Mullooly: Kind of doubles down the good grades they’re already getting. Robert Scott: Right, precisely. Absolutely. Tim Mullooly: Being a college professor, you get some pretty firsthand experience with a lot of the younger generation and students coming in each year. Tim Mullooly: Yep. What would you say is the most important thing that one student could learn while they’re in college? And I know that that’s probably a difficult question to answer. But, you know, whether it’s actual class material or just a life lesson. Robert Scott: Those years are really important, 18 to 22, I mean, I’m generalizing. Those years between 18 and 22, there’s just such a, it’s a really valuable developmental phase where you really do go from being sort of a kid in your parents’ household to being an independent, educated adult who’s going to have a job and pay taxes and bills and things like that. And there’s this really interesting maturation. That’s why it’s fun to watch the students when they first come in, and then you see them when they graduate. The changes that happen is, it’s pretty amazing. Some of the things that they could learn, one of the most important things I think is to, A, study something they’re really interested in, that there’s this misguided perception out there, if you study something like philosophy, for example, that that’s not going to pay the bills. You have to study something practical. The data, generally speaking, does not back that up. The reality is, some of the best people, successful people on Wall Street studied philosophy, they studied English, they studied, just as one example. A lot of medical schools are looking for kids that didn’t study science necessarily, but studied lots of other subjects, English and whatnot, economics, and you know, other areas. In some countries, what you study in college, that’s what you’re going to do. You really don’t have a choice. In the United States, it’s much more flexible. You can get a degree in English and go to medical school. You can get a degree in philosophy and go to law school. Really, you can get a degree in anything and go to law school. It’s interesting. I had a student this past couple of years, and she did her honors thesis on looking at some of these issues, student debt and whatnot. But she also, one of the things that she looked at was, she handed out a survey to students and said, “Did the idea of how much money you were going to make influence your decision to major in what you majored or are majoring in?” And overwhelmingly, students said yes, that that was a primary concern for them. I think it’s a shame, it’s not necessarily a terrible thing, but I do think it’s a shame when somebody goes and they study something that their parents want them to study or they think this is going to get them a job, but their passion or what they’re really interested in is somewhere else. Tim Mullooly: Like we were saying before, you have to love what you do. Robert Scott: You do. And I didn’t pick economics, I had no idea what I was going to do with economics. I had no clue, I just thought it was really interesting. And I just couldn’t read enough of it. 25 years later, I still can’t read enough of it. I still, that’s what I do. I drive my wife crazy with it, and everybody else, because it’s what I, I really enjoy it. And if I had been forced to take chemistry or something else, I would’ve been miserable. Tim Mullooly: There are so many different ways to bridge the gap between fields. I started out working here at an investment firm. I didn’t think there would be that much psychology involved. But, it’s almost overwhelmingly psychology based than investing. Robert Scott: Absolutely. It’s very true. Tim Mullooly: Finding something that you can study and enjoy, rather than forcing yourself to go down a certain rabbit hole that you might not really love. Robert Scott: Yeah. And I think that’s, at least my job as an educator, is to make sure the students really do what they’re going to enjoy. Tim Mullooly: Financial literacy isn’t exactly where it should be. Seeing students come into college, is there one or a couple different concepts or topics that you feel that students should have a better grasp on by the time they get to college that they don’t necessarily do? Robert Scott: I can’t think of anything specifically where they’re lacking. I designed and taught a personal finance course for, we have a program called First Year Seminar. And so it’s basically, every freshman is required their first semester to take a whole litany of options that are available. And so, my dean at the time sort of said, “Hey, would you want to create and teach something?,” when they were starting the program. I was like, “Sure.” So I taught personal finance. Tim Mullooly: You’re also not making money. Robert Scott: Right? Making any money. So it’s sort of this double whammy, just the impact on that. They have a grasp on credit cards. It’s been hammered into people, “Credit cards are bad, high interest rates and they’re expensive.” And so students pretty much had a good sense of that. You know, before I agreed to come on this with you, I listened to a number of your podcasts and I really enjoyed them. I really thought it was great. I guess if I didn’t like it I wouldn’t be here, right? But I thought your advice, everything I listened to, I listened to four or five of them which was spot on, I thought it was really terrific. And the one I really liked the best was about the car. The expensive automobiles are just the most bizarre thing in the world. 95 percent of the time, your car is doing nothing. It’s just sitting in your garage or in a parking spot. It’s depreciating in value. People are hitting it with their car door, they’re bumping into it. Birds are doing … And yet, people spend so much money to drive a nice car that they’re really not in that much. And so it’s funny because you guys were talking about that and that’s one of my things. Because I drive an 11 year old car with 130 thousand miles which is my wife’s old car. I don’t drive much because I’m three miles from the university, and so I’m not really in my car that much. I mean, if I drove a lot, it might be more of a concern. But it’s not that it’s unsafe, it’s just not fancy. Tim Mullooly: Yeah, you just got to be practical about it. You know, you think about how much money that you’re spending versus the time that you actually spend in the car. And it’s disproportionately so expensive. Robert Scott: It’s crazy. It’s one of those things that it’s hard to fathom. And students, I see them falling into that sort of a lot, where they’ll overpay for a car even though they’re not even in it that much. And the parking’s a pain, and all the rest of it. But that’s advice in general. That’s something I sort of hammer into them too as they start their first jobs and whatnot. Don’t get lured into this, “Well now I’m going to drive a really expensive car.” Make some money first, save up for it. Tim Mullooly: I feel like younger students have the want to show off the new car or something, be flashy. Tim Mullooly: Everyone does too. But like you were saying, when you get your first job, you finally have, you’re making money and you want to do something with it. But, you know, you got to do something smart with it. That’s the thing. Tim Mullooly: Future you is going to be very pissed that you didn’t do that. Robert Scott: Yeah, exactly. Well, there’s something in behavioral economics called Future Discounting. We’re all bad at it. The problem is, our future self-20 years from now, we don’t care about that person. That person doesn’t exist to us, because 20 years from now, who knows what’s going to happen. So it’s really hard for all of us to sort of say, “Alright, I really need to start putting a lot of money away as early as possible so that my future self will be comfortable.” Cause you will get to that future self. And it’s just hard for people to understand that. Tim Mullooly: Along the same lines as that, with students going into college, they have to make decisions about student loans. And, like you were saying before, they don’t have any real concept of the consequences of taking on that much debt. 40 thousand dollars doesn’t register in their head the way that it would for someone who’s been working for a while. Robert Scott: Yeah, it’s really interesting. I have a grant that I’m doing right now. It’s looking at the impact of student loan debt on first time home buyers in New Jersey. And so as part of this research project, I’ve been interviewing a lot of mortgage bankers and other people. I did a survey and then I’m following up and making phone calls and talking to people about it and seeing what they know. It’s really interesting. I’ve talked to a number of people, one person in particular who sent me, said he’s just been horrified by the student loans and the impact and the cost. And he sent me, he erased all the names and everything, but he said, “You’ve got to see this.” And I said, “What?” He said, “You’ve got to see this,” he said, “This is one year,” and I won’t tell you the school. It was not Monmouth. But one year of graduate school, the person had racked up 60 thousand dollars in debt. And it shows on the bill how much that’s going to cost once they pay it all off. I think the amortization was like 15, 20 years, something like that. It was going to be over 160 thousand dollars. And that’s one year. Tim Mullooly: That’s not even the whole total. Robert Scott: No. When the person’s done, they’re going to be a quarter of a million in, unless you’re guaranteed to really be doing well, that’s tough. Robert Scott: That’s right. I’m a parent. I have two young daughters. People always say to me, “oh, you’re a college professor. Your kids can go to school for free and they can go to other schools at discount,” and all the rest of the stuff, and I said, “Yeah. But what if my kid’s 18 years old and she’s about to go to high school and I drop dead?” That’s not a great plan. Or, I said, “What if I change jobs or something else happens?” Lots of things could happen. There’s no guarantees. So all of a sudden, they’re going to come up, ready to go to college, and have nothing? The problem is, you only have 18 years. And so your investment, the reason retirement’s such a great deal is if you start young, you’ve got 40, 50, 60 years before you’re going to draw on that. So you can really rack up that compound interest. But with college savings, you’ve got 18 years. And that’s if you start from day one, right? And I know, because I’ve done the research, most people don’t start until much later. Tim Mullooly: We see that a lot too. Tim Mullooly: “You should’ve started that,” yeah. Robert Scott: Precisely. And I think a lot of people think, “Oh, they’ll get an academic scholarship or they’ll get a basketball scholarship or a baseball scholarship,” and that’s not good planning. Tim Mullooly: There are so many different variables, known and unknown, that you can’t even consider at the time. So just having something in place is more than likely the right way to go. Robert Scott: In my research, very few people save anything for their kid’s college education. And I think to myself, what’s interesting is, people are stressed. Some people can’t save anything. That’s fine. But even among people who can, they’re not really saving and you think, “Geez, you have a kid. That’s your big expense.” When you have a kid, in 18 years, that’s it. You’ve got to be really ready for that. And, like I said, if they get a scholarship, they happen to be a great athlete, they get a scholarship or they happen to be really smart and get an academic, that’s great. But what if they go to graduate school? Tim Mullooly: You can’t bank on all of that being covered. Tim Mullooly: You just have to plan for that. Robert Scott: Yeah. And I think people have to be realistic with their kids, and I think kids need to talk with their parent about, “What can we reasonably afford?” You’ve got several different options of colleges, four or five different options, what makes the most sense financially? Right? And, “What do I want to do? Where do I want to go?” Factor all of those things in. Tim Mullooly: Hopefully they can find some sort of balance between, we were talking before we turned the microphones on about people having their heart set on one certain school and when they get in, it’s like, “All right, I’m going.” But then you take a step back and it’s like, that might not be the most economically smart choice to make. So, hopefully parents can find some sort of balance between finding the economically sensical school versus the school their kids actually want to attend. Tim Mullooly: That trade off, kind of. Robert Scott: Right, exactly. A tradeoff is right. And that’s a smart way to think about it. If you’ve got all the money in the world, do whatever you want. If you can afford to pay the bills and it’s not going to affect your retirement account or anything else and your parents, no big deal, then go do anything. Tim Mullooly: Yep. More power to you. Robert Scott: Yeah, it’s great. Hopefully your parents planned that well. But I know that when it comes time for my girls, we’re going to sit down and really have to just think about what’s really best, what they might want to do later on. Tim Mullooly: Dealing with the younger generation so much, read a lot in the media, people knock millennials sometimes on what we do and how we’re still living at home, no one’s saving money and all that stuff. Are there certain things that you’ve noticed that younger people are better at than the older generations? Robert Scott: I find students to be much more flexible in the way they look at things. So I don’t think that students today are any different. I feel bad for the students in a lot of ways, in some ways. And this is going to sound bad, make me seem older than I probably am, but when I went to college, I didn’t have a TV. I didn’t take a car. We had a bus that took us up to the mountain. There weren’t all the distractions. But what was I going to do? I was going to sit in my dorm room, talk to my friends, go study, go to class. Honestly, it was like, if I weren’t sitting in class, what would I be doing? All my friends are in class. I’d be sitting alone twiddling my thumbs. Versus today, where, between Netflix and the online video games and everything else, who would want to leave their dorm? I wouldn’t want to leave my dorm room. Tim Mullooly: There’s so much going on. Robert Scott: And I think it’s really important, going back to your other question: what should you do in college? Well, you should write a lot, you should read a lot, you need to learn how to think on your own. Because, the skills today are going to be irrelevant in five, ten years. You’re going to need to learn new skills. So you need to learn how to think. I think that’s really important, is learning those different skills. And so, it’s harder to do that today because it’s harder to think big thoughts when your cell phone’s going off every five seconds. Tim Mullooly: So like you were saying, they’re more flexible to different ways of learning because they have so many different ways to learn, so they’re not really set in their ways yet? Robert Scott: They are, except, what’s so funny about it is students still want the traditional methods. They still like being in class with the professor and the other students. They still like having a physical book. They still like taking notes. All those sort of standards that have been around for a thousand plus years, those ideas, those concepts, students still adhere to that. It still works for them. My best compliment that I can get is a student coming out of class and saying, “I can’t tell whether you’re right or left. I can’t tell whether you’re republican, democrat, an independent or a whatnot.” And I say, “Good.” It’s not my job to profess what I think. My job is to present the material and the information and to sort of say, “Hey, from an economic or a financial standpoint, this makes sense. This doesn’t really make sense and here’s why.” And they sort of say, “Boy, I can’t nail you down.” Or some people will say, “You’re one way,” and other students will say, “No, you’re the other way.” If half the class is split, they have no idea about my political views, that’s success. Tim Mullooly: Has that always been the case with students, or has it changed more so over the last couple of years with different technology? Robert Scott: Yeah, I mean, there’s no question. When I started at Monmouth, let’s say, I started in 2004, fall 2004. There weren’t really smart phones. There weren’t, I mean, they were really in their infancy. There wasn’t an iPhone. I don’t think there’s any question that there was less distractibility. The students were less distracted and whatnot. I think there’s no question that the cell phone has had both good and bad, but there’s no question that it has an impact. Every professor has stories of, drives her crazy with the students with the cell phones in class. It’s just habit. You’re always checking the thing. And I have one too and it’s very easy to just pull it out and check your email or see who texted you or called you or whatever it might be, and it takes away from that ability to really be present in a class among your colleagues, among the other students. You can tell that there’s a distraction there. That is definitely a noticeable change, a big difference. Again, the students haven’t changed at all. That’s very noticeable. Tim Mullooly: You touched briefly on credit cards before. You know, everyone get beaten into their heads credit cards are bad. But there are still so many people out there today with lots of credit card debt. Robert Scott: Oh yeah, it’s growing. Tim Mullooly: We see people coming in everyday with more and more credit card debt. What’s one way or idea that you could help people out to try and better manage their debt or look at it from a different perspective to help them utilize it better? Anyway, what can you do? Certainly, avoiding credit card debt is ideal. How do you avoid credit card debt? A few things. One is having an emergency savings fund. And I think that the best way to do that is do it in a passive way. Research is very clear, and I’ve been studying financial literacy stuff for a long time, research is very clear that if you set aside a little bit of money, no matter how much money you make, it’s actually fascinating because the poorer you are, the more of an impact this has, that even putting back just a little bit of money every single month let’s say, because you could set this up if you have an online checking account or whatnot, direct deposit, you can automatically have a little bit of your money sent over to savings, and you just don’t even think about it, just automatically goes over there. I think the best way to combat a lot of credit card debt is for people to boost their emergency savings so that, boy, if that car repair comes up and it’s a thousand bucks, rather than put it on the credit card which is just going to sit there for a long time generating tons of interest, you can dip into that emergency fund and pay that thousand bucks. Now you don’t have that debt. It’s really interesting. For really poor people, even saving just a little bit of money, even a small cushion goes a long way. Obviously the more money you make, the more you have to have as a backup. We talked about the car issue. People overspend on their car. I don’t, but I’m cheap. My wife has the new car. She drives a lot, so I justify it that way. But for credit card debt, I think a lot of people, they overspend in other areas like a car and other things, and they don’t allow themselves enough breathing room, enough flexibility in their budget when things do come up. And so I think the more breathing room you can create in your budget, the better. You can free things up. So if you have kids and you have money automatically coming out of your paycheck or out of your checking account into 529 plans, which is what I do, because honestly, you’d just forget. If I had to write a check every month, I’d just forget. I’m a typical absent minded professor, and so I just automate the whole thing. Tim Mullooly: It makes everything so much easier. Robert Scott: It does. And you don’t think about it and it’s not there and you don’t factor that in. Well all of a sudden if there’s a financial issue or whatnot, well I can then, that month or whatever, I can go into the account and say, “Okay, I need that money this month,” and I’ll do it. Fortunately, I haven’t had to do that. But I think if people had more of that, they could go into their emergency savings, they could stop automatic savings for other things and not have to go into debt. We live in a consumer society. A guy by the name of Thorstein Veblen who was an economist wrote a great book in 1899 called the Theory of the Leisure Class. And it was all about, I mean, it’s a lot. It’s a really great book. But one of his concepts was, everybody wants to live one stratum above where they actually are. If you can afford a Honda Accord, you want to drive a Mercedes. If you can afford a Mercedes, you want Bentley. If you can afford a Bentley, you want a Maybach or a Bugatti or whatever it is. Everybody wants to be that one stratum above where they are. So they stretch their budgets and that’s a hard thing to combat. That’s a hard thing to deal with. I think that’s just people being really honest with themselves. I would say a budget is like a diet, so when I’m explaining to the students and I say, “If you take in more calories than you burn every day, what’s going to happen?” They say, “Well, you’re going to get fat.” Right, exactly. So if I spend more money than I make every year, what’s going to happen? Well you’re going to go broke, right? You’re going to go into debt. It’s really simple. So then the magic is balancing those things out and making sure that you’re not expending too much and whatnot, so that you’re in sort of a healthy environment. And I always tell them, “I don’t want you guys living off of ramen noodles for the rest of your life.” And I don’t think that’s smart either, but you have to be practical about it. So, there are amazing stories of people who readjust their diets and they lose 100 pounds in six months or a year or whatever it might be. I think financially, for a lot of people, they could put themselves in a similar situation. I think it’s important for people to think of disaster scenarios. I think it’s important for people to really think, “What if I lost my job? What if I died? What would happen to my kids? Where would the money come from? I get hit by a bus and my oldest kid is 17 years old, what then? Are they going to be able to afford college?” Is that kid going to have to instead, maybe they’re a straight A student and they really want to go to college but they can’t because they have to support the other kids so they have to go get a job. Do you want them in that situation? I forget exactly what the statistics are so I’m paraphrasing a little, but essentially, you’re 10 times more likely at a younger age to carry life insurance than disability insurance. But you’re like 20 times more likely to become disabled than you are to die. Tim Mullooly: It seems backwards. Tim Mullooly: You think you would rather have disability insurance there. And so I think it’s really important to think of, I mean it’s morbid, the economics, the dismal science. But I do think it’s important to think of those disaster scenarios, paying down those expensive debts, paying down the credit card debt as quickly as possible. And I tell students this all the time, “I’m not anti-credit card. I have a bunch of them myself. I like the points and all the rest of the stuff. You get cash back and whatnot.” But in the credit card industry, anybody who pays off their bills every single month which is like me, my family, we’re called deadbeats. They hate us. Because we cost them money. Because they’re lending us free money for a month or two and they’re giving you two percent cash back, or Amazon has their five percent back for Prime items, things like that. So they’re losing money on people who pay their bills every single month. They’re not losing money, they’re getting other fees, but generally speaking, it’s not nearly as profitable. It’s very profitable if people rack up the debt. So the important thing is to become a deadbeat. Tim Mullooly: They’re banking on people living far above their means. Robert Scott: Right. Psychology, right? Everybody wants the new iPhone or the new whatever. And so I do, I think it’s really important for people to sort of think of that budget in dietary terms and manage all the line items, everything. Track all the expenses. Look at every single piece. A dollar 99 for the apple hard drive you have to rent to get your hundred gigabytes of space, everything. You know? Tim Mullooly: Downgrade and pay less. Companies know that you’re going to overspend with certain credit cards. Casinos use casino chips and stuff because psychologically, it doesn’t feel like money. Tim Mullooly: It’s not real money. Tim Mullooly: It’s chips. Exactly. Tim Mullooly: It’s all human nature, everybody falls susceptible to it from time to time. Tim Mullooly: It’s never too late to get back in line too. It’s not like, “Oh, well a year’s gone by. I haven’t looked at the expenses. That’s too much work. I can’t do it.” You can always get back on track. Robert Scott: That’s an expensive mistake. Yeah. That’s a really expensive mistake to not do that. Tim Mullooly: We got one last question for you here. Tim Mullooly: Apart from teaching, what’s one thing in life that you’re really passionate about? I know you were talking about skiing before, are there any other things that really get you going? Robert Scott: I love to bike. I did 35 miles this morning. I love to play golf. I also like running. I’m injured right now, injured myself at the Asbury Park half marathon. But I’m getting better thanks to my physical therapist. But, you know, I think related to this, I have two young kids, two young daughters. So they’re most of my time. Any free time I have outside the university gets largely spent with them. And thinking about financial education, I start with them early. We give them an allowance and they have to save some, they have to put some in donations and then they have some to spend for themselves. And I think starting really early and trying to teach them that those values, the value of a dollar and that you do certain things, you get certain money and whatnot, I think raising the next generation, I really don’t want my kids to grow up to be awful, obnoxious, terrible people. I really want my kids to grow up to be polite, conscientious, respectful people who understand the value of a dollar and how to take care of things. And so, my wife and I, luckily my wife is on the same page. A lot of time gets spent with my kids and thinking about what their lives are going to be like in the next five, 10, 15, 20 years. And I think as a parent, you have such a big, awesome responsibility to make sure that they have the opportunities that they can. Not just buying them stuff, but providing them the foundation to be successful, whatever that is. I don’t really care what they end up doing. Whatever they choose to do is great for them, terrific. As a parent, you just want them to have the freedom to do that. Tim Mullooly: Kind of tying it back into where we started, you want to make sure that they’re doing something that they love. Tim Mullooly: that they’re passionate about and not forced to in any way. Robert Scott: No. I mean if they want to grow up and be a mechanic or a hairdresser or a stockbroker, whatever, I think as a parent, your job is to listen to your kids, help guide them as best you can, again, and make sure they’re not obnoxious smart Alecs, that they’re good people, and that is a difficult thing to do, by the way. Kids will be kids. I think that you really have to spend that time, and my wife and I have been really lucky to have that time with them. So that’s been a surprisingly important thing. Tim Mullooly: To make sure that they turn out okay. Robert Scott: Right, I just don’t want them to be terrible human beings. And so, not only do I not want them to be serial killers or anything, like, okay, let’s go the other, I also just don’t want them to be obnoxious people. So that is a full time job right there. If you’re listening to this on iTunes, please subscribe to the podcast to get new episodes every week, and feel free to leave us a review or a comment, because it would really mean a lot to us. Be sure to follow us on Twitter and Instagram at L, W, M, underscore podcast for more news and updates about the show. Robert, thank you for coming on the podcast. Tim Mullooly: It was a pleasure talking. Maybe we’ll have you back on in the future to continue the conversation about financial literacy and helping people get on track. Robert Scott: That would be great, happy to do it. Tim Mullooly: Well, that’s going to do it for this episode of Living with Money. Thanks for listening and we’ll see you on the next one.